I’m still relatively new to the art of bikepacking. I say art but to be honest I haven’t quite decided if it’s an art (and a dark one at that) or a science. Either way you certainly develop a level of ingenuity and cunning you probably didn’t realise you had when it comes to packing things into your various frame-suspended bags. It also really challenges you to understand exactly what you can and can’t get away with for a trip, which will obviously depend on a lot of factors, though from my experiences so far these are rather dominated by the unpredictability of the British weather. 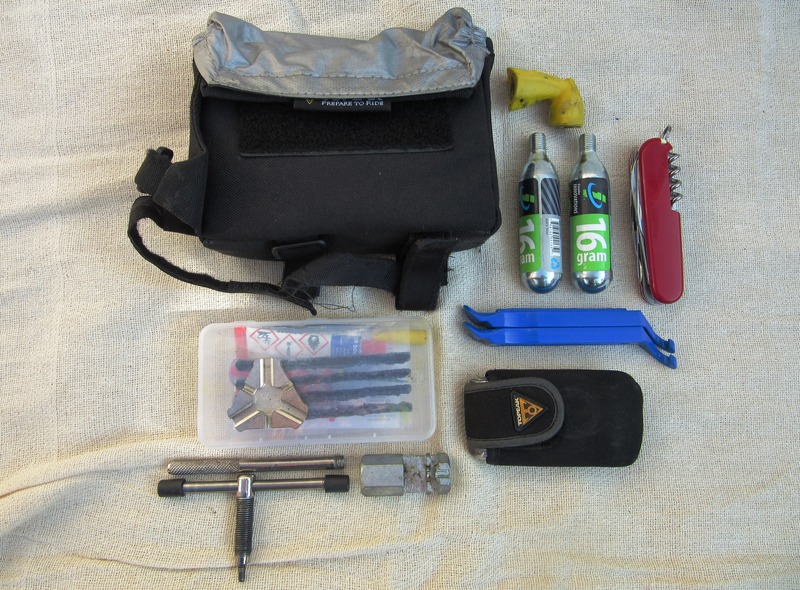 So I am certainly no expert, there are much better sources of tips, wisdom and shared experiences elsewhere on the web but that said I wanted to list out my bikepacking kit in case, like me, you are new to it, or even thinking about trying it. 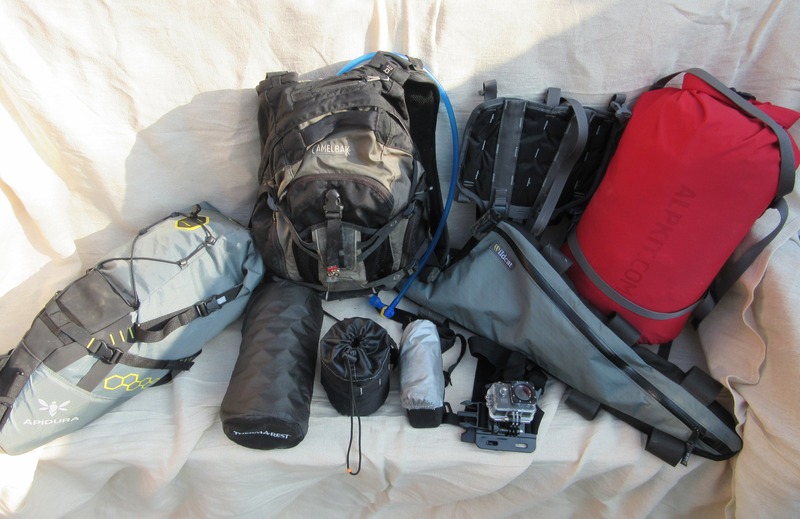 My kit and the way I carry it has certainly evolved (but not too radically) over the course of the last year. 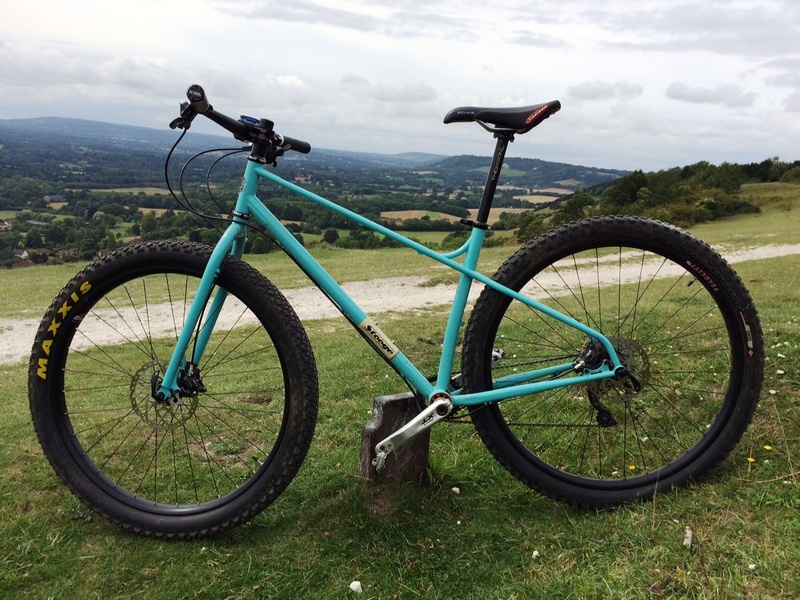 For my first trip I utilised one of my 26 inch bikes (I know, how old school is that!) 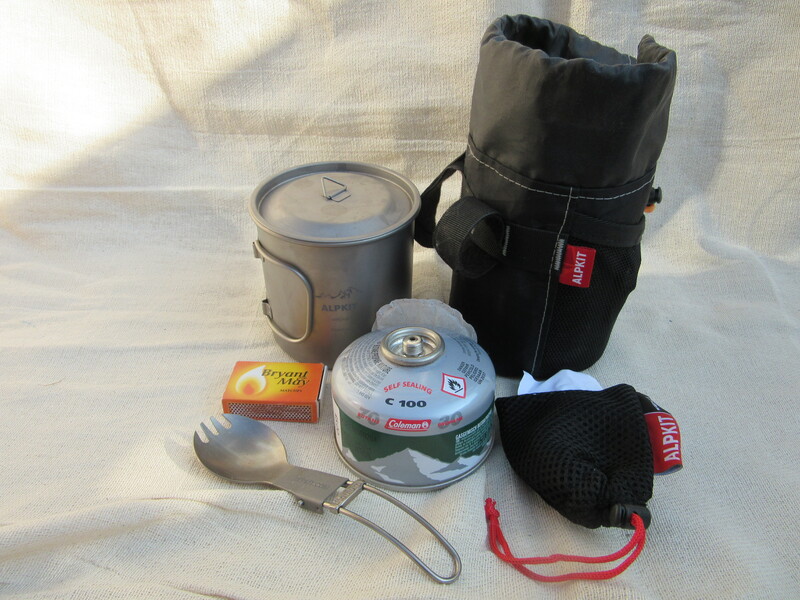 and carried stuff that I would usually take camping, or had knocking about the garage. The only additions to this were a couple of drybags from Alpkit that I could secure to my bike. Fast-forward the best part of a year and I’ve added a couple of other specialist framebags and upgraded a few items of kit to save some weight. Now my kit broadly packs into six ‘bags’ of varying sizes with the rest of the stuff either being on me or bolted directly to my bike. Give or take a few items this is what I took on a recent trip but this could obviously be modified for the season or weather you might be facing. Let’s start with the base, the frame for all that gear. 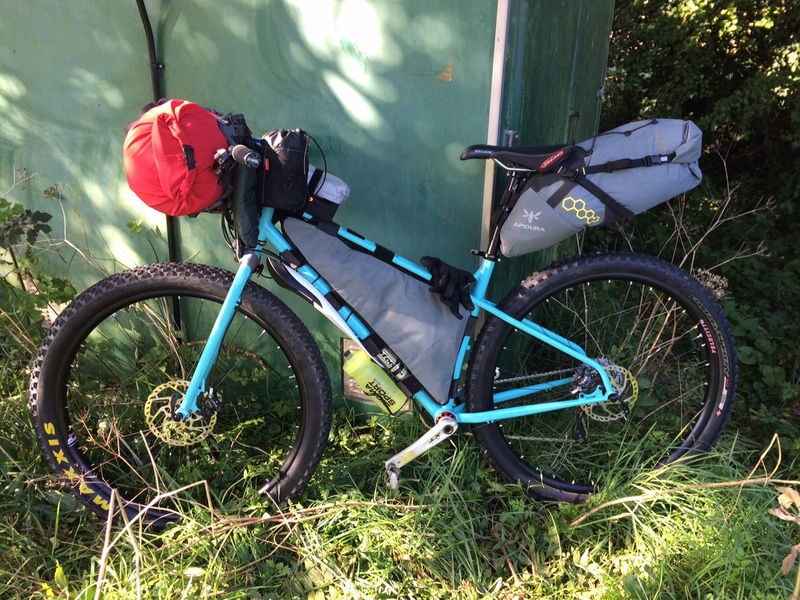 I use my Stooge – you can find my review of it here – which whilst it isn’t a dedicated bikepacking rig like offerings from Surly or Salsa, it’s a bloody versatile beast and I love it. It also feels super stable and balanced when fully loaded. Just on that point, I’ve read a few times that the best bike for bikepacking is the one you’ve got (although some have more choice than others!) so don’t think you need a specialist bike for the job. 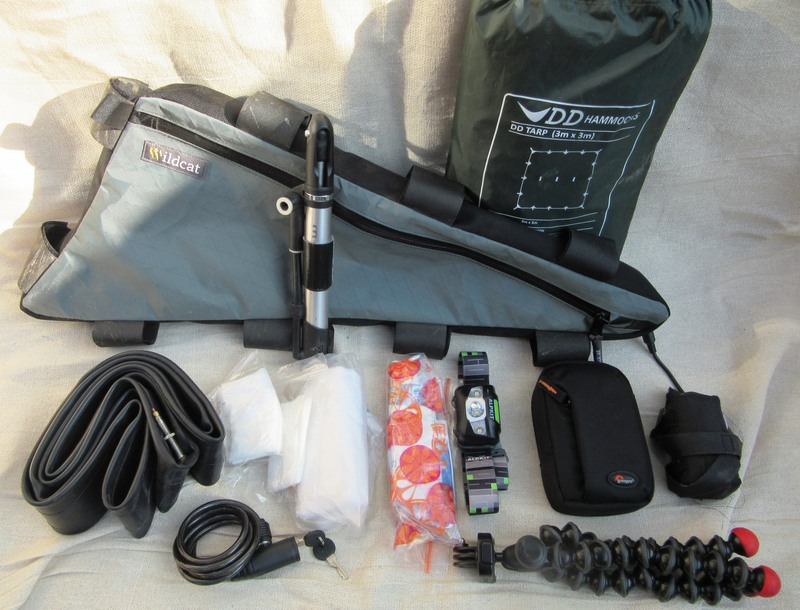 On the front goes this double entry dry bag which attaches to the Kanga harness. For quite a few months this simply clipped to the bars which was fine but on rougher ground it would bounce around and flip my Garmin upside down! Last month I bought the Kanga harness from Alpkit and it was a revelation on my most recent trip, keeping everything very stable indeed. Now I’ve purchased the Kanga I could also secure my Thermarest to the top of the dry bag. All of the above will squeeze into the mug. On top of that I can get a few trail snacks (like a Kellogg’s Nutrigrain or some dried fruit). Spare 29+ tube – as massive as it is, I just can’t chance it! I like to keep as much weight off my back as possible so won’t carry 3 litres of water if I know there’ll be somewhere to fill up after a couple of hours (and on longer trips I’ve got the extra bottle under the frame). I’m not riding through the vast wilderness of the USA after all. Jack Daniels Honey – very important for a good night’s sleep! Depending on the season you might want to think about sun protection and insect repellent too. A fairly new addition, this replaces Alpkit’s 13L tapered dry bag which I had hung under the saddle, but could never stop it from swaying too much from side to side. 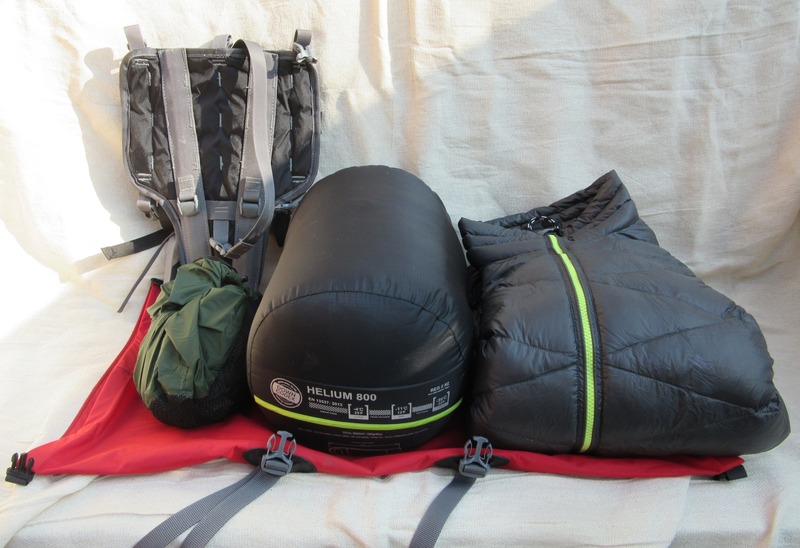 This bag from Apidura is really stable, well thought out and cavernous too! The tapered bag can now be used as a liner. If I’m completely honest with myself, I’m still guilty of carrying too much kit and it’s the clothing that I’ve yet to really get to grips with. 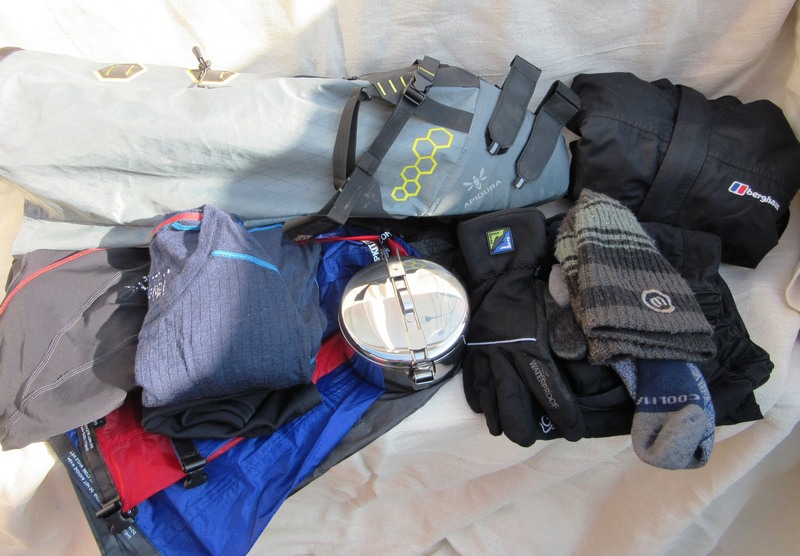 Not so much on summer ‘quick overnighters’ where you can be comfortable with minimal kit, but the longer trips we’ve done can throw up all sorts of weather. Take our trip last month. The night before we left, temperatures dipped to near freezing so I ended up taking a few extra layers only to not use them at all. I am someone who has always lived by the saying ‘expect the best, plan for the worst’ and whilst there’s nothing wrong in that, it can leave me over-burdened. Interestingly, this year’s winner of the Tour Divide, Josh Kato, has since talked about taking what kept him happy and not worrying about the extra weight. It’ll be a while before I’m lugging my kit 2,750 miles though!